Floral gold rexine lazer cut out on red satin fabric card. Envelope in gold. Inserts in gold in red color printing matching to the main card. The color of the card can be customized. - Approximate Height : 25 cm Width : 20 cm. - Approximate Net Weight : 180 gm. 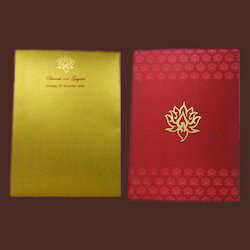 Our quality-assured range of wedding cards include Wedding Invitation Cards. These cards are provided to the clients as per their specific requirements and the theme & design decided by them. Our range of cards is designed and developed using high quality material. These can availed from us at highly competitive prices. A sobar yet eye catchy wedding card. Colourful inserts adds to the beauty of the card. Size, colour and design can be customised as per requirement. We are one of the most leading industries in the market for the manufacture and sales of traditional Indian wedding cards. We have a very colorful and extensive collection of cards made out of classic Indian texture for our clients to choose from. We understand and meet the needs of every community in India with the satisfaction of providing them with a truly Indian taste.